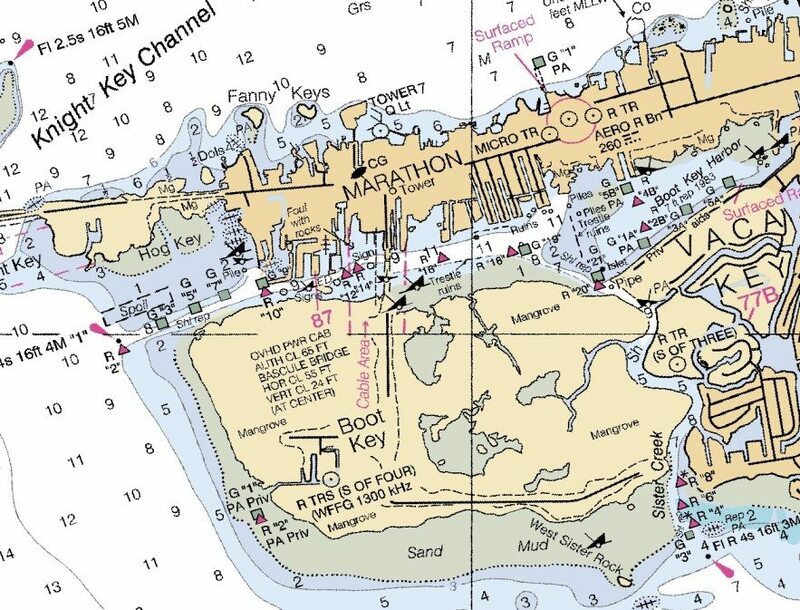 The entrance to Boot Key Harbor is blocked at the bridge to vessels with masts above 50′ + or – Notice to Mariners has been issued by the U.S. C.G @ 1800 hrs. Several boats have been damaged today & yesterday 3/19 & 3/20. I reluctantly waited to post this message until early this morning (3/21/12), when I could personally speak with our very special Florida Keys Correspondent, Captain Charmaine Smith Ladd, and get all the facts. Charmaine CONFIRMED the sagging lines, which are apparently the result of a sailcraft with an unusually tall mast hitting the lines earlier. Captain Charmaine said her vessel is anchored in a perfect position to see waterborne traffic, as it approaches the power line. No more than fifteen minutes before we talked, a sailboat came within less than 50 feet of hitting the lines, but was warned off at the last minute by a local fishing craft!!! Charmaine reports that a repair crew is on the way to Marathon from Big Pine Key, and this problem will hopefully be short lived. She will report to the SSECN just as soon as repairs are completed, and we will update this posting immediately thereafter!!!! And, in case anyone is thinking they can bypass the low hanging power lines by entering Boot Key Harbor by way of Sister Creek (from Hawk Channel), my own soundings and Captain Charmaine’s extensive experience with this channel causes us to warn off any cruisers whose craft draws more than 4 feet. This channel is just too tricky without very specific local knowledge for deeper draft vessels. Stay tuned! The Salty Southeast Cruisers’ Net will bring you updated info here, on our Home Page, just as soon as it is available! Good morning Claiborne. My boat was one of the ones that had damage from the [utility lines] in Boot Key Harbor. My mast is 62 feet. The clearance showed 65 to 64 feet. Claiborne, thank you so much for posting this information regarding Boot Key Harbor. The service and information you provide to the cruising community is why so many of us visit your sites regularly. Greetings! Have not seen any repairs done to the line today. However, boats with mast heights of 55′ are getting through comfortably. One vessel said his mast height was close to 60′, but often times others don’t think of what they have on top of their masts. Bottom line: not repaired yet. The winds have subsided somewhat and I don’t think the utility line will sag any further. That was an issue of concern during the recent winds. This Thursday afternoon, around low tide, a sailboat with a mast height reported to be 63.5′ plus whip antenna, made it out under the wire. They hugged one side of the bridge/channel opening to avoid the lowest part of the wire. Sorry, can’t provide better detail. Low tide was .10 below chart data. Also, rumour has it that AT&T will not be out for at least 2 weeks!